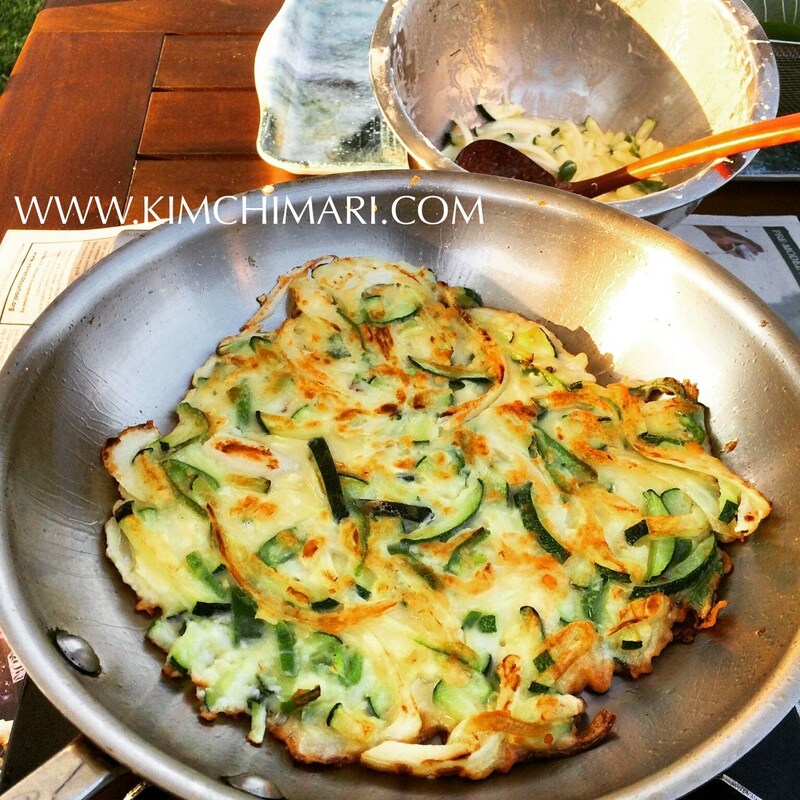 Gluten free Hobak Buchimgae-Zucchini Fritters for summer dinners!! This was so yummy I just had to share right away. For dinner yesterday, I decided to make some gluten free hobak buchimgae outside in our backyard. I usually use a non-stick pan but I decided to use my 10″ all-clad stainless frying pan. I think this made it extra yummy. I have made gluten free hobak buchimgae before but it usually came out gummy or too thin, which I did not like either way so I stopped making it for a while. But this came out perfectly good – actually felt lighter and more crispy than a regular flour buchimgae. I think this has become my new favorite Korean savory pancake (jeon or buchimgae) batter. Add Trader Joe’s gluten free flour, rice flour, water, beaten egg, salt, onion powder. Not sure of the exact amount but batter should be similar to a loose pancake batter. Enough batter to barely cover the zucchini and onions. 80-90% gluten free flour and just 10% rice flour. I used 1 egg for this batter and the rest was all water – which made about three 10″ pancakes/fritters. Use good amount of oil, hot pan (using a nice thick stainless pan helps) and fry until both sides are nicely brown and crispy. Serve with some soy sauce + vinegar. If you can get a hold of some makeoli (막걸리), it will be just heavenly!! I love zucchini fritters and the two different flours for crispiness sounds a great idea; Will be tryingsoon : ) thanks for most interesting blog, always something yummy on the go. Well done.